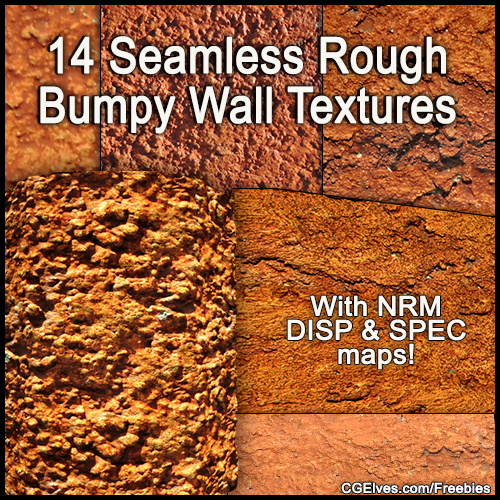 Looking for free seamless rough bumpy wall textures? Here’s a pack of 14 bumpy wall seamless textures with Normal maps, Displacement maps and Specular maps. All the tileable rough bumpy wall textures are 1024×1024 pixels in size. You may use our hi-res rough wall textures for your personal projects, commercial projects and in your client projects. Our seamless bumpy wall textures are used by 3D artists, 3D environment artists as well as for 2D photo-manipulations, concept art and matte painting. Want the original rough bumpy wall photos of 3264×2448 pixels in size? Download the original HD rough bumpy wall photos here. Check out all our other free seamless CG textures and hi-res texture photos. We hope you enjoy our free seamless rough bumpy wall textures pack!